"Marinated short ribs are grilled until crispy on the outside and tender on the inside. These full-flavored ribs are a sure-fire hit." Score meaty side of ribs, opposite bone, 1/2 inch apart, 1/2 inch deep, lengthwise and crosswise. Place ribs in large plastic food storage bag. 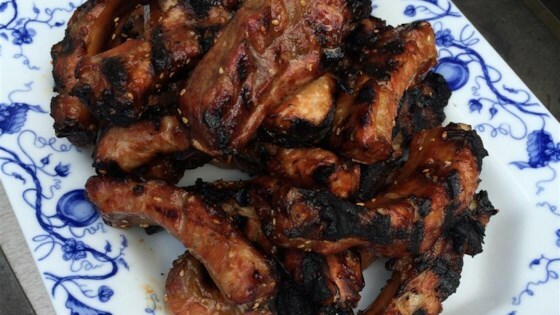 Combine teriyaki sauce, sesame seed, sugar, pepper sauce and garlic; pour over ribs. Press air out of bag; close top securely. Turn bag over several times to coat all pieces. Refrigerate 4 hours, turning bag over occasionally. Grill or broil 4 inches from hot coals or heat source 15 to 18 minutes, or until ribs are brown and crisp. Turn ribs over occasionally. used boneless ribs, delish. superb with rice on the side - make extra sauce (boil on stovetop) for the rice! Excellent. Wouldn't change a thing, my husband was very pleased with this meal. Served it with Italian style vegtables.